Shot preparation is as important to making good shots as the actual execution itself. Without good preparation, your body isn't capable of producing the power, balance and control needed to hit an effective shot. After the split-step, your racket should be taken back at the same time as you pivot your foot and move to the ball. In other words, your racket should be back by the time the ball has gotten to your side of the net. After mastering the basic timing of the backswing, you should decide which kind of backswing you want to take. Most tennis players use two different types, whether they know or not. The simplicity of taking the racket back in a straight line is attractive to many players, especially beginners. The racket should be parallel to the ground at waist level, with the tip of the racket head back first. When hitting your forehand, your elbow should be comfortably close to your body and slightly bent as the arm extends back. (If you are struggling to get out of the habit of having your elbow away from your body, try keeping a tennis ball in between your body and elbow). The left hand is used to direct the racket head into ready position. The hitting arm should be slightly bent. Most professionals use a circular backswing which provides a continuous and rhythmic motion. The tip of the racket head still goes back first, with the arm and wrist following. The racket head ascends to eye level, the arm bends at the elbow (not wrist), and the body rotates to the side. Near the end of the backswing, the racket head starts to drop down as the arm straightens somewhat at the elbow (not by dropping the wrist) to the ready position. The arc of this swing should appear like a large oval. The backswing is started too late or too early. This leads to misplacement of the ball. This can be caused by having to run out to get a ball or simply a bad habit. If you notice that you are having these problems you can seek the advice of a professional coach or, for some problems, practice muscle memory. If you are having a problem with your arm being too straight, for example, try practicing the correct swing repeatedly without actually hitting a ball. This will re-teach your muscles the correct way of hitting the shot. Tomaz Mencinger currently works in Slovenia as a tennis coach and a mental training coach. 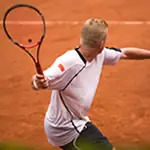 His video series on How to Play Tennis (and Como Jugar Tenis -- the Spanish version) offers beginners a solid foundation in tennis fundamentals to start playing tennis correctly.